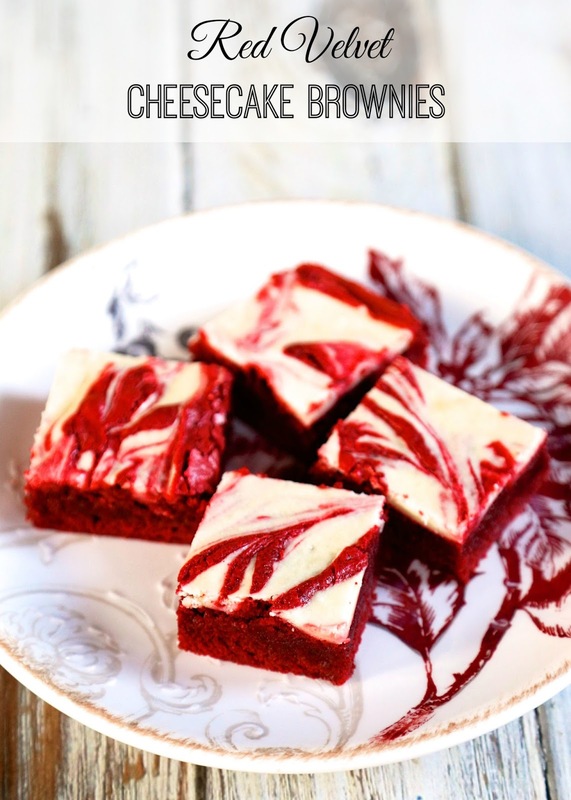 Red Velvet Cheesecake Brownies - homemade red velvet brownies with cheesecake swirled in the batter. All of my favorite desserts combined into one amazing recipe! These are SO good!!! Makes a great homemade gift. Perfect ending to you holiday meal. 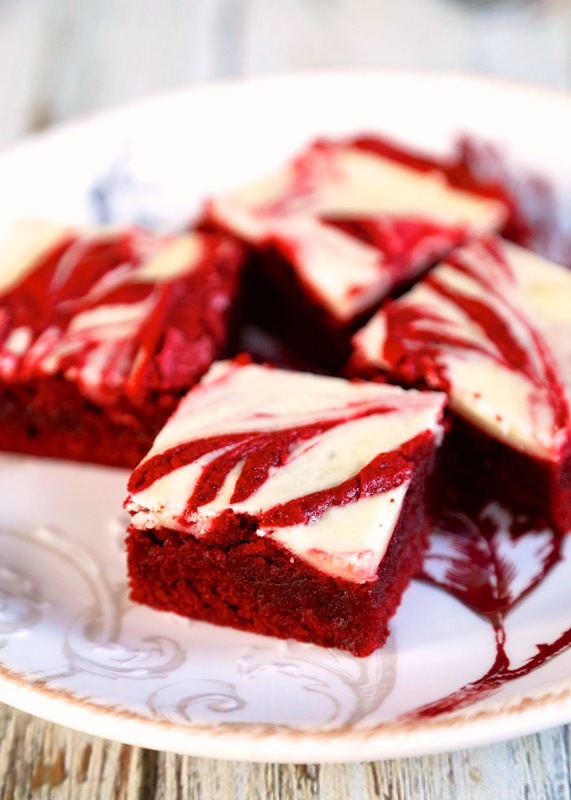 We love this red velvet brownie recipe! Red Velvet Brownies are one of our favorite holiday treats. They are amazing! I decided to change them up a bit this year and add a little cheesecake to them. The result? Amazing! I mean how could they not be? Red Velvet, brownies and cheesecake. YUM! These brownies only take a few minutes to whip up. I had them ready in the time it took for the oven to preheat. One note, the brownies use a whole 1-ounce bottle of red food coloring. That is correct. Just dump the whole thing in. I promise it will work. The brownies have a vibrant red color and taste fantastic. Preheat oven to 350°. Line bottom and sides of a 13- x 9-inch pan with aluminum foil, allowing about 2 inches to extend over the sides; spray foil with cooking spray. Microwave chocolate and butter in a large microwave-safe bowl on HIGH for 1 1/2 to 2 minutes or until melted and smooth. Whisk in 2 cups sugar. Add eggs, whisking just until blended after each addition. Add food coloring and 1 tsp vanilla. Gently stir in flour and salt. Pour batter into prepared pan. Beat cream cheese and remaining 1/4 cup sugar with an electric mixer until fluffy. Add egg white and remaining teaspoon of vanilla. Mix until blended. Stir in 2 Tbsp. flour until smooth. Drop cream cheese mixture by heaping tablespoonfuls over batter in pan; gently swirl with a knife. Bake for 30 to 32 minutes. Cool completely. Lift brownies from pan, using foil sides as handles. Remove foil and cut brownies into squares. These look so pretty for the Holiday table.